The new Democratic Party is no party for old white people. ...As for which Democrats they will target, the grass-roots organization welcomed its members to submit nominations of candidates and potential districts to target in 2020. Justice Democrats said it will prioritize women and diversity in its recruitment. All four incoming House members who were backed by Justice Democrats are women of color: Ayanna Pressley, Ilhan Omar, Rashida Tlaib and Ocasio-Cortez. ...Tlaib, a fellow democratic socialist who had the support of Justice Democrats in her competitive primary for Rep. John Conyers Jr.'s old seat, threw her support behind the new campaign as well. "Help uplift women like us at all levels of government. We still need more of you to run with us. So get your squad together. 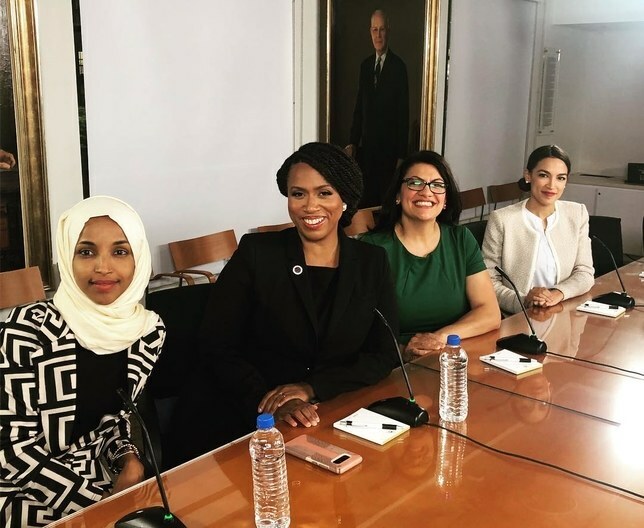 We are waiting for you," Tlaib said in a statement. The grass-roots group expects to focus more on safe Democratic seats -- as Crowley's was -- than on the swing districts, largely centered in the suburbs, that the party won en route to the House majority. That's a slight shift in strategy after all of the group's candidates, such as Kara Eastman in Nebraska, came up short in Republican-held congressional districts in 2018. Replacing safe Democratic incumbents with more progressives and diverse leaders, the thinking goes, could move the Overton window of what is and is not acceptable in the Democratic Party. "There's lots of blue districts in this country where communities want to support a new generation of diverse working class leaders who fight tirelessly for their voters and build a movement around big solutions to our country's biggest problems," said Rojas. As the third highest ranked Democrat Joe Crowley -- who was replaced by Ocasio-Cortez in a racially changed campaign which sought to highlight his whiteness -- found out the hard way, it doesn't matter if you've given the progressive cause a lifetime of service. If you're not representative of the New America�, you've got to go.